The San Francisco Peninsula is a peninsula in the San Francisco Bay Area that separates San Francisco Bay from the Pacific Ocean. On its northern tip is the City and County of San Francisco. Its southern base is in Santa Clara County, including the cities of Palo Alto, Los Altos, and Mountain View. Most of the Peninsula is occupied by San Mateo County, between San Francisco and Santa Clara counties, and including the cities and towns of Atherton, Belmont, Brisbane, Burlingame, Colma, Daly City, East Palo Alto, El Granada, Foster City, Hillsborough, Half Moon Bay, La Honda, Menlo Park, Millbrae, Pacifica, Portola Valley, Redwood City, San Bruno, San Carlos, San Mateo, South San Francisco, and Woodside. As a local geographic term, "The Peninsula" is distinct from "The City", and refers to the portion south of San Francisco. The appellation may date to the period, prior to 1856, when the City of San Francisco and the County of San Francisco were separate entities, the latter then coextensive with contemporary San Mateo County and San Francisco City-County. The City-County owns several disjunct properties along the whole of the Peninsula (mostly water pumping stations connected to the Hetch Hetchy Valley on which San Francisco has a permanent leasehold); thus, most of the larger communities in San Mateo County are de facto suburbs of San Francisco, with the neighboring communities of Pacifica, Daly City, Broadmoor, Colma, South San Francisco, Half Moon Bay, San Bruno, and Brisbane being immediate suburbs. The remaining suburban area of the Peninsula is on the east side of the Santa Cruz Mountains, along San Francisco Bay; the west and south-central portions of the Peninsula are mostly rural, unincorporated and unorganised areas. 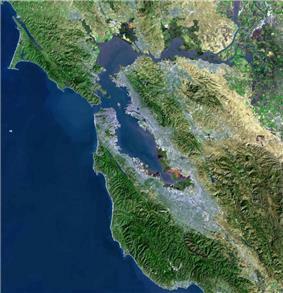 The east side of the peninsula is a heavy densely populated and a largely urban area that includes portions of Silicon Valley. It forms a commuter area between San Francisco to the north and San Jose to the south. A number of major thoroughfares run north-south: El Camino Real (SR 82) and US 101 on the east side along the bay, Interstate 280 down the center, Skyline Boulevard (SR 35) along the crest of the Santa Cruz Mountains, and Highway 1 on the west along the Pacific. The Caltrain commuter rail line runs roughly parallel to the El Camino Real (State Route 82) and Highway 101 corridors. The bridges in the Peninsula include the Dumbarton Bridge, the San Francisco - Oakland Bay Bridge and the San Mateo-Hayward Bridge. Along the center line of the Peninsula is the northern half of the Santa Cruz Mountains, formed by the action of plate tectonics along the San Andreas Fault. In the middle of the Peninsula along the fault is the Crystal Springs reservoir. Just north of the Crystal Springs reservoir is San Andreas Lake after which the famous geologic fault was originally named. ^ a b "Early days in Menlo Park". ^ "Service Area." Golden Gate Appliance Repair Repairing Appliance in San Francisco Its Metro. HouseHunt.com, n.d. Web. 23 May 2014.